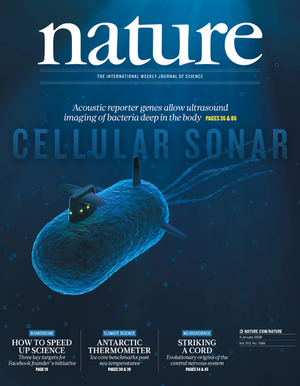 Congratulations to Ray, Audrey, Anu, Arash, Priya and Suchita on their work on acoustic reporter genes, featured on the cover of Nature! Bourdeau RW, Lee-Gosselin A, Lakshmanan A, Farhadi A, Ravindra Kumar S, Nety SP, Shapiro MG*. Acoustic reporter genes for noninvasive imaging of microorganisms in mammalian hosts. Nature 553, 86–90 (2018).